A wide range of accommodations with daily maid and linen service ensure your comfort. Choose from standard rooms or suites that offer single or double occupancy, or from apartments or cottages that can accommodate up to four people. Capt. Don’s Habitat Dive Operation has three 1-tank boat departures daily and scheduled boat night dives to over 70 moored sights on their custom built, diveboats. Each mooring buoy is limited to 1 boat so you’ll have the reef all to yourself. Total Diving Freedom means diving is available 24 hours a day, 365 days a year. 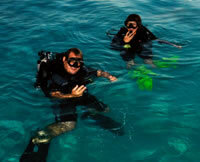 Over 50 world class dive sites are within a 15 minute boat ride. 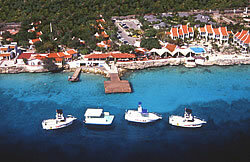 Shore diving is a must at Habitat, and the island of Bonaire is rated as the top shore diving destination in the world. Following accepted safe diving practices, you can grab a tank and go….whenever you want! The Habitat Dive Operation is not only a PADI 5-star Instructor Development Center, but also a NAUI Dream Resort, SSI Referral facility, and TDI/SDI Instruction Center equipped to handle all of your certification needs including Rebreathers and Tri-Mix. Choose from over 20 specialty courses. All needed equipment is available for rental or sale in the Captain’s Locker which also has those last minute items you may have forgotten. Exposures Photo Center provides guests with a full selection of the latest in photo and video equipment for rent or sale, personalized instruction, film processing, and private photo shoots. It’s also a fun place to hang out and “talk photo” with the friendly photo pros. At Captain Don’s Habitat you have a choice of 2 restaurants, and a bar where you can enjoy a cocktail while watching a fabulous sunset. 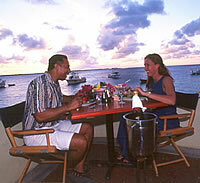 Oceanfront dining with an international menu and daily local specials. Breakfast is served from 7am to 10am. The buffet includes a wide array of fresh tropical fruits, breads, and cereals, as well as eggs cooked to order. Lunch is enjoyed between 11:30am and 2pm with delicious salads, sandwiches, burgers, and snacks. Evenings, relax to another perfect sunset and enjoy a la carte dining Tuesday through Sunday. Monday night is “eat as much as you can” BBQ buffet from 7pm until 10pm. No need to worry about reservations for breakfast or lunch, reservations are, however, recommended for dinner. Authentic Italian thin crust pizza baked to perfection in a traditional stone oven. Open Daily from 3:00pm to 10:00pm. Happy Hour daily from 5:30pm to 6:30pm – Drinks 1/2 Price. Live Entertainment on Monday and Thursday with special events throughout the year.